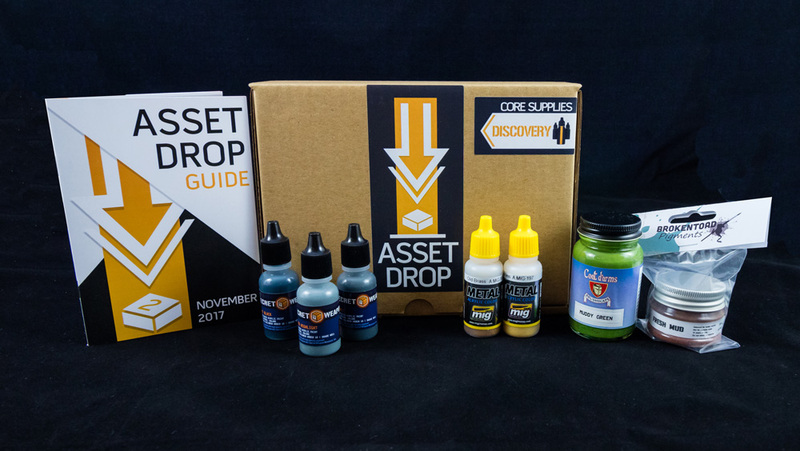 Discover what's inside an Asset Drop Discovery box! The second Asset Drop box was shipped to our wonderful subscribers a few days ago, and it’s time to reveal to everyone else what a great treat they got this month! As you know, the aim of Asset Drop is to discover new brands and types of miniature paints. We’re for the curious painter who wants to see what else is out there, and trust us, there’s a lot of amazing paint to choose from! This month featured 4 completely new brands compared to October’s box. If you like the look of November's box, you can buy it on our store, complete with our custom Painting Guide. November was also excellent value for money, containing over £28 worth of premium miniature paints, all for just £19.90! That's nearly a 30% saving on RRP. Check out Beasts of War's 2-Part Review of our November box below! You can also check out the contents of October's box here and December's box here. These paints have been produced in partnership with Reaper Miniatures (who made the MSP paints from October’s box), because of the company's revolutionary use of multiple base formulations for their paint. The Rubber Tire set is Secret Weapon’s most popular trio from the new line of acrylics, and is especially cool because the Tire Black paint has a satin finish perfect for imitating rubber! The trio are high quality, covering really well and drying fast to a smooth finish. As well as use for painting tires, the colours are ideal for painting dark armour due to the satin sheer of the Tire Black. This technique was covered in our exclusive Painting Guide! 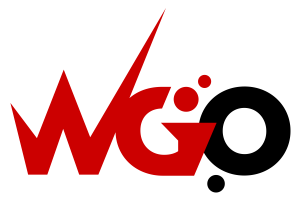 AMMO is a line of paints and weathering effects created by Mig Jimenez, an experienced modeller and product creator from Spain. We chose to feature these AMMO metals because they are ideal for layering. The key to rich metals is layers of colour, but metals don’t always thin down very well. These are the perfect mid-way point between a standard thick metal and a thin airbrush metal. You can paint them straight from the bottle for a smooth even coverage. Old Brass and Brass are great colours for armour, anything steampunk or weapons, working as an ideal base colour and highlight. We also think having a range of metallic colours is an essential component of any model painters arsenal. I’ve always been a fan of textured paint for basing. They’re fun to work with and can produce a range of different effects, ideal for adding more realism to your miniature. If you’re not familiar with Coat d’Arms, they are owned by Blackhat Miniatures and are the original creators of Citadel paints! Their Brushscapes range are particularly good; being packed full of texture, coming in large bottles and having rich colours to work with. BrokenToad are a UK company founded on the mantra of producing high quality products at an affordable price. They have a range of their own dry pigments, as well as a series of beautiful resin busts for painting and a set of kolinsky paintbrushes designed for miniature painting (the MK2 line). 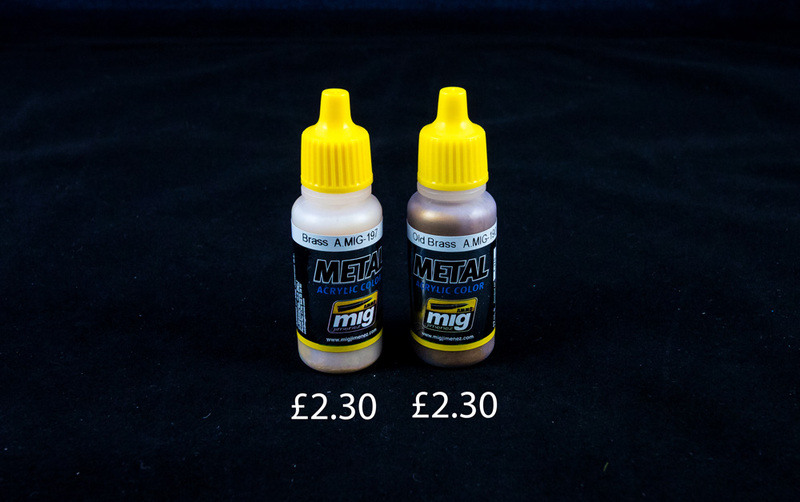 The Grimy Dirt pigment in this drop has many applications from creating mud, to dust washing vehicles. In fact, it’s such a flexible colour, it can even be used for sand too. In this case, we chose it specifically to mix with the Muddy Green Brushscapes paint to produce a second shade to use on bases. That way our subscribers can mix the mud tone in with the muddy green tone to create a churned grass look. 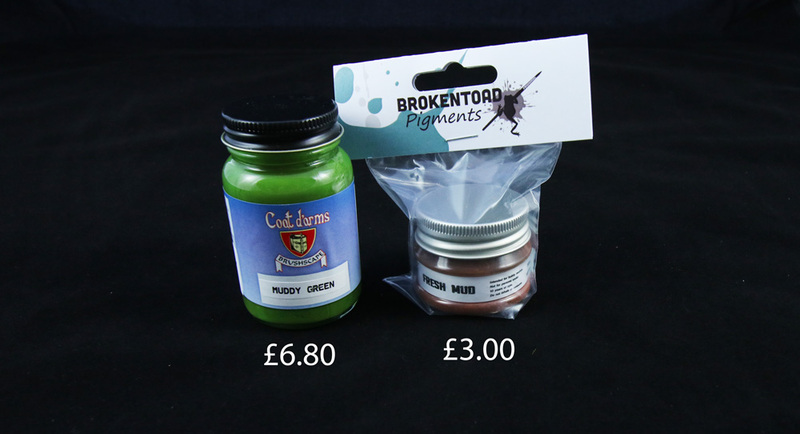 We also provided five other examples of how the BrokenToad pigment and the Muddy Green textured paint could work in our exclusive Painting Guide (provided in every drop). These examples included creating a vibrant green field and even a desert landscape. Please note: if you buy this box on our store, the Grimy Dirt pigment from the original box is now the Fresh Mud pigment (pictured above), as that specific colour is no longer in production! Places on our Discovery subscription are always limited with only a few opening up each month. Sign up for the latest box, if it's available, by click the link below! Once you sign up for a box, you will get a 15% discount in our store off products and past boxes.